There are two main influences that drive the automotive industry to introduce and develop more energy efficient automobiles. Hybrid automotive technology and other alternative fuel powered automobiles are nothing new to the industry, there were cars run on plant based oils in the early 1900’s and electric cars have been around for decades. Though these alternatively powered vehicles were in existence earlier, there were always problems with either production or performance issues. Currently though the market has swung and there is more and more demand for alternatively powered vehicles each year now. Chevrolet, and its parent company General Motors, have seen this demand and answered it by offering two vehicles that embrace and utilize hybrid engine technology. Chevrolet tackled the issue of alternative vehicles, hybrid powered vehicles to be specific, by offering two main production models, the Chevy Malibu and the Chevy Tahoe. Hybrid technology allows for electric motors to run in tandem with standard petroleum powered engines. The idea is that the electric motor can power the incidental and accessory items in a vehicle like air conditioning, stereos, lights, and power windows to name a few. While that is happening, the regular engine can use less power overall while it is devoted solely to powering the vehicle down the road. The Malibu joins a growing list of hybrid vehicles being offered by the major car manufacturers and the SUV Tahoe sticks out as one of the few truly hybrid SUVs available on the market today. 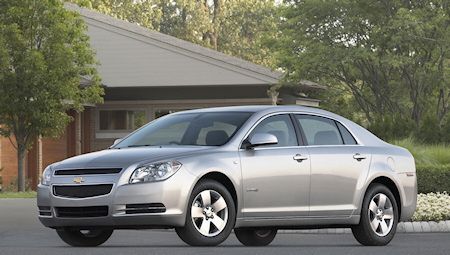 The 2008 Chevy Malibu Hybrid is a great option for vehicle buyers interested in the purchase of a hybrid vehicle. The Malibu has a very modern appearance with 18 inch alloy wheels accented with chrome. The modern appearance and functionality follows inside as well with heated bucket seats, climate control system, and more. The six speed automatic transmission provides more than enough power to move this sporty looking family friendly vehicle down both in-town and highway/freeway roads. Safety is also covered well as the 2008 Malibu also attained five star crash ratings in both front and side impact tests. Two of the more popular reasons a vehicle buyer may purchase a 2008 Chevy Malibu Hybrid is for its fuel efficiency and its benefit to the environment. The Malibu Hybrid is a very nice green vehicle, but doesn’t exhibit the phenomenal gas mileage found in some other hybrid vehicles on the market. The stated mileage is 24mpg in the city and 32mpg on the highway which may or may not be better than a buyer’s current vehicle’s performance. The 2008 Malibu Hybrid also comes equipped with a dashboard indicator that will let the driver know when the vehicle is operating at its most efficient. It truly is one of the nicer hybrid vehicle options available for consumers to take a look at. The 2008 Chevy Tahoe Hybrid was a direct response to Ford’s Escape Hybrid. Chevy has replaced the wasteful V-8 standard engine with a newer and better designed V-8 engine that also takes advantage of newer “green” technology. This newer engine makes use of Active Fuel Management as well as a two mode hybrid propulsion system. 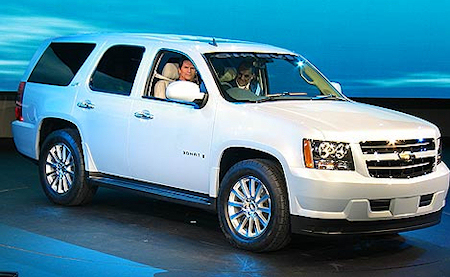 Amazingly, the Tahoe Hybrid appears to have similar high performance results as the standard Tahoe model. Add to that the increased fuel efficiency, the eyes of many skeptics were opened wide when the Tahoe Hybrid began reporting mileage of up to 21 in the city and 22 on the highway, which is borderline phenomenal for a large size luxury SUV. In terms of accessories, options, and features, the Tahoe Hybrid has won over new fans and kept fans of the previous models satisfied as well. The new Tahoe features updated looks and lines with a sleeker shaped body including a front end with a lower profile, more pleasantly shaped contours, and a much improved grille. The 2008 Chevrolet Tahoe Hybrid has impressed industry experts so much that after being out on the market for less than a year it was able to garner many awards like the Green Car Journal’s Green Car of the Year. The coming need for alternatively fueled vehicles has been acknowledged by many and embraced by some. Chevrolet embraced this theory and produced two of the more popular, accessible, and positively received hybrid vehicles, the 2008 Chevrolet Malibu Hybrid and the 2008 Chevrolet Tahoe Hybrid. There will be much excitement in the years to come looking at all of the new hybrid technology that builds on the development and production of the current hybrid technology, and it appears that a large segment of automobile buyers will be waiting and willing to give it a chance.